Thank you for visiting our Washington Relocation Guide. Inside you will find information about a beautiful destination on the West Coast of The United States and the cities and towns that will encourage you if moving to Washington State. Washington covers 71,303 square miles and has a population of 7,405,743 people according to the 2017 U.S. Census. 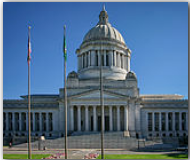 Washington’s capital is Olympia, which has a population of 51,202. Other important cities are Seattle (pop. 704,352), Spokane (pop. 215,973), Tacoma (pop. 211,277), Vancouver (pop. 174,826), Bellevue (pop. 141,400), Everett (pop. 109,143), Federal Way (pop. 96,757), Kent (pop. 127,514), Yakima (pop. 93,986) and Bellingham (pop. 87,574). Washington was admitted to the Union on November 11th, 1889 as the 42nd state. The state flower is the “Pink Rhododendron” and its’ nickname is “The Evergreen State”. Washington is bordered by Canada to the north, Idaho to the east, Oregon to the south and the Pacific Ocean to the west. Washington’s economy is broken into two categories; agriculture and industry. Seafood, dairy products, apples, cattle, wheat, potatoes and nursery stock provide for the agricultural side. While aerospace, software development, food processing, paper products, lumber and wood products, chemical products and tourism provide for the industrial side. Washington’s climate varies greatly from west to east. A Mediterranean Climate predominates in western Washington, and a much drier semi-arid climate prevails east of the Cascade Range. Major factors determining Washington’s climate include the large semi-permanent high pressure and low pressure systems of the north Pacific Ocean, the continental air masses of North America, and the Olympic and Cascade mountains. In the spring and summer, a high pressure anticyclone system dominates the north Pacific Ocean, causing air to spiral out in a clockwise fashion. For Washington, this means prevailing winds from the northwest bring relatively cool air and a predictably dry season.